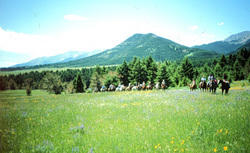 The Lazy K Bar Ranch, operated by the Van Cleve family since 1880, is located on 22,000 acres at 6,000 feet in a beautiful mountain canyon. The ranch is home to the Van Cleves who offer their hospitality to a selected number of guests each summer. Ranch activities include everything from unlimited guided riding, stock work, fishing, photography, bird watching, swimming, hiking, square dancing, rodeos and overnight trips to just loafing around. We have a competent children's wrangler who plans and supervises activities and rides for children ages 6 to 12. It is best to dress in informal, comfortable clothing. Blue jeans, cotton or flannel shirts, jackets, sweaters, boots, straw hats and rain jackets are great for daytime activities. Cotton dresses are appropriate for dinner for the girls and fresh jeans or slacks for the men. No shorts, please. Directions: Directions to the ranch will be provided with confirmation of reservations and acknowledgement of receipt of deposit. Isolated in mountain canyon at 6,000 feet.